The Iranian New Year begins on the first day of spring, when the whole world comes to life again, and nature becomes colorful and delightful to behold: the day winter ends and spring begins. The history of Norooz goes back to pre-Islamic times; some even claim it to originate thousands of years before Islam, in the days of Jamshid, the mythical king who is said to have ruled over the land about 2000 years before Christ. Ferdowsi (941-1005), Iran's most illustrious epic poet, relates the Norooz to Jamshid, and Omar Khayyam (1048-1123) the Iranian scholar, poet and mathematician says about Norooz: "The reason why Norooz is thus named is that every 365 and one quarter days the earth makes one complete turn round the sun and when Jamshid learnt about this fact he named the day Norooz (new day)." Some scholars believe that the Norooz celebration was held even before the emergence of Zoroaster but no one can give an exact date for his birth and estimates vary by thousands of years. To ancient Zoroastrians every good human being has an inner force which exists in the heavens before the human's birth and goes back to heavens after his/her death, remaining there as pure and innocent as before. But these heavenly forces do not forget their loved ones and come to earth to visit them. 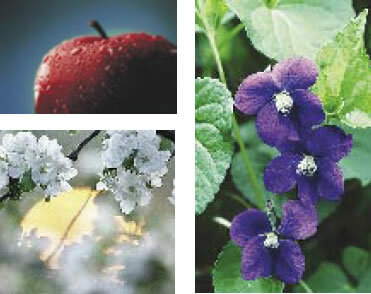 This inner force is known as Farvahar and the name of the first Iranian month Farvardin comes from the same term. These holy spirits are thought to return to the earth during the period 17th to 27th March and they expect the dwellings of their descendants to be clean and orderly. Therefore, Zoroastrians and later Moslem Iranians cleaned their homes, washed whatever could be washed, swept the floor and made their homes clean and respectable, worthy of receiving the sprits. And the tradition continues even today, among townspeople, villagers, nomad tribes, all alike. On 21st March the Norooz or Farvardin celebrations begin and continue up to the 13th when all Iranians go on a picnic in the countryside for those who can, or to parks within cities for those who are too for away from the countryside. On the 1st day of Farvardin, the New Year's Day, people go to visit each other, the younger generation first going to the homes of the elders who will return back the visit on the same day or at the earliest opportunity, in order of the visits they have received. Nowadays, with the increasing limitations imposed by modern life, relatives gather each in one place, in a restaurant for example, and spend a day together instead of visiting each other at homes. It is both less costly and for more convenient. But traditionally each home must prepare itself to receive many guests during the first few days. Huge quantities of nuts, sweets and fruits are tastefully arranged in large bowls for the guests to enjoy. And it is always customary for the elder members of the family, in order of age, to give eedi (New Year's gift) to the younger members, in cash. Ancient Iranians believed that the creation of the earth and heavens took place in one day while some religions consider it to have been completed in six or seven days, which may be an indication of the influence of the Iranians' ancient religions on the later religions of the world. Ancient Iranians also believed that if the members of any family fill their homes with spite and sorrow during the first ten days of the new year the heavenly guests will not long stay and will leave the family with dissatisfaction and sadness. Ancient Zoroastrians held the first day of every month in reverence, particularly the first day of the first month of the year, which was considered to be the great Ahura Mazda's day. For ancient Iranians the New Year Day was also the day that symbolized the renewal of agricultural activities and preparation of the ground for spring farming. It was also important to the ruling class, as the basis for collecting taxes was in accordance with the solar year, which agrees with the four seasons. When Moslem Arabs later conquered Iran they adopted the Iranian solar year for state fairs as it was more convenient, while retraining the lunar year for religious purposes. The solar year and the New Year celebrations were also convenient as they encouraged Iranian subjects to bring precious gifts to Arab Caliphs and governors, as they had previously done for their kings and governors. Later still, when Iranian governors turned against their Arab masters, ancient customs, the Norooz in particular, helped them in arousing national feelings and reviving the people's patriotism. The Iranian governors that were first appointed by the Caliphs ultimately became independent Iranian but Moslem states and it was thanks to the revival of old Persian customs and traditions, mainly the Norooz, that this independence came about. Samanians, who ruled over the Greater Khorassan from 892-999, emphasized on Persian literature and culture and revived this culture despite the strong Arab influence. It was this same culture, its traditions, and literature that helped Iranians survive the Mongol invasion and massacres, cruelty beyond human imagination, humility for a great nation at the hands of semi-barbaric nomad tribes. The culture not only helped Iranians survive but also absorbed the Mongols, civilized them and turned them into Iranian poets, scientist and scholars. 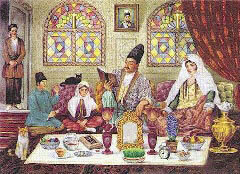 On the day of the New Year it is customary for each Iranian family to gather round a large napkin laid on the floor on which seven items are placed whose names begin with the letter "S", the figure 7 having had a mysterious, awesome and perhaps even a sacred significance for ancient Iranians. "Serkeh" (vinegar), seeb (apple), sekkeh (coin), sabzeh (herbs), somagh (rhus coriaria, a kind of food seasoning), senjed (wild olive), samanoo (a desert), being the usual items. There are many explanations for the significance of the letter "S" but none is quite convincing. (For farther notes please refer to Events No 4 March 2004.) Besides these items a volume of the Holy Koran is always an important part of the Haft Sin. The Holy Koran is read by the head of the family at the time the New Year is to arrive.